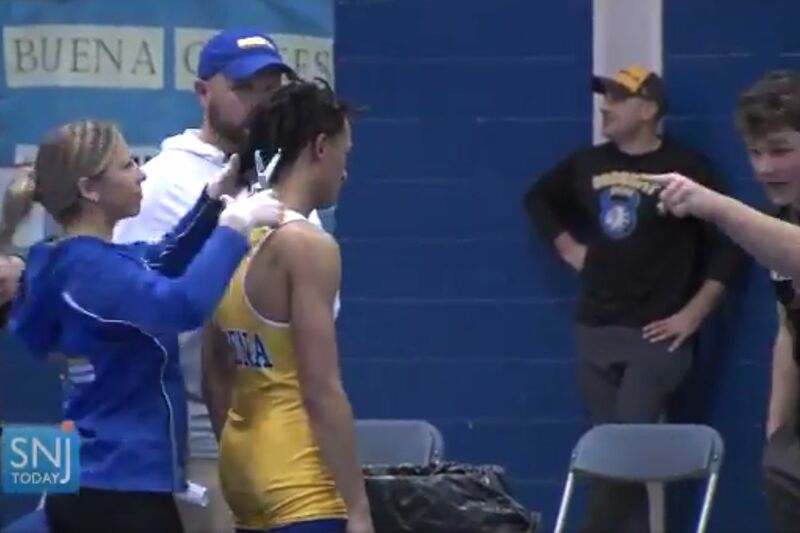 In this image taken from a video, Buena Regional High School wrestler Andrew Johnson gets his hair cut courtside minutes before a match. In a notice of tort claim sent to 12 possible defendants this month, Maloney alleges he has suffered $100,000 in damages. The possible suit comes amid two pending investigations into a Dec. 19, 2018, match that Maloney was officiating in Atlantic County. It sparked controversy after wrestler Andrew Johnson decided to have his hair cut after the veteran referee told the teen he could not compete without a hair covering. A video of the hair cutting was posted online. It shows a distressed Johnson standing on the mat as a Buena trainer uses scissors to cut several inches of hair. The video went viral, and the incident soon prompted charges of racism and holding a cultural bias against Johnson and other black scholastic athletes. It was referred to the state Attorney General’s Office for review to determine whether Maloney, who is white, acted appropriately. In this file photo, Referee Alan Maloney (standing) officiates at a South Jersey Group 4 wrestling final in 2016. Maloney said Johnson violated the athletic association’s rules governing hair and did not have a legally sanctioned hair covering. Maloney said the proper time — 90 seconds — was given for Johnson to correct the problem. “Mr. Maloney properly performed his duties as the referee and fairly applied the rules governing a wrestling match,” Maloney wrote in the notice, obtained by The Inquirer, that he filed on his own behalf. His attorney, Ralph Paolone, also a wrestling coach at Holy Spirit High school in Absecon, did not respond to telephone and email messages to his office Monday. The comments in Maloney’s notice are his first public remarks about the incident. He did not respond to messages left Monday at his home. A person who answered the phone at his business, Auto Radiator Service in West Berlin, declined to comment. Other referees have said Maloney was simply enforcing rules. Speziali has maintained that Johnson’s hair length fell within regulations and that Johnson was singled out. Maloney said Johnson needed a covering not because of the length but because his hair “wasn’t in its natural state” and referred to the dreadlocks as “braids,” the lawyer has said. Maloney’s fate remains up in the air pending the probes by the Division on Civil Rights and the NJSIAA. Speziali and other critics have questioned why the investigations have not been completed nearly three months after the incident. Civil rights activists have called for a revocation of Maloney’s referee license. “The panel’s investigation has been active and is ongoing, with additional interviews planned in coming weeks,” Cherenson said in a statement. A spokesperson for the state civil rights agency declined to comment. Buena H.S. wrestler Andrew Johnson (left) wrestles Cherokee's Andrew Aromando during the Buena vs. Cherokee H.S. wrestling match at Timber Creek H.S. on January 11, 2019. Aromando won the match 4-2.